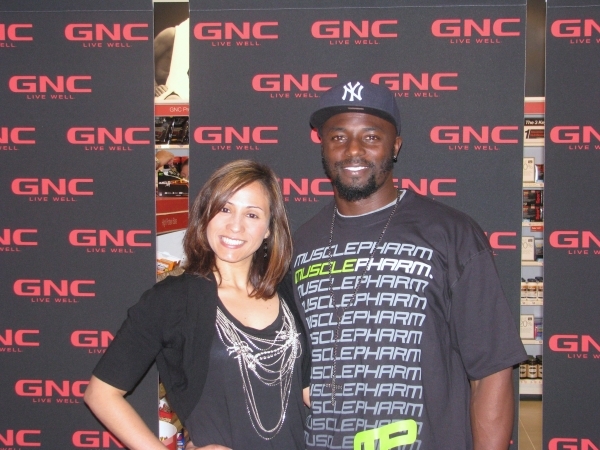 VIVE Katerin met with Santonio Holmes, wide receiver for the New York Jets at GNC where he was on hand for the store's grand opening and to promote MusclePharm, a nutrional supplement. Rather than dwell on whether or not their will be NFL football this fall, VIVE Katerin spoke with Santonio about something a bit more certain - his commitment to raise money for the David Clowney Foundation. According to their website, the charity works with inner-city youth and empowers them to succeed through mentorship, promoting positive self-esteem, offering support services, college preparation and scholarships. Santonio specifically gets involved not only with fundraising, but also with mentoring youngsters in his hometown of Miami, FL. As a teenager, Holmes almost succumbed to the streets and even got involved with selling drugs. Fortunately, his mother's faith in him and his desire to play professional football kept him from getting in too deep. His strong athleticism kept him on the right track and got him accepted to Ohio State University where he helped the team win the 2002 championship. He was drafted to the Pittsburgh Steelers in 2006 and aided the team in winning the Superbowl in 2008. He was subsequently traded to the Jets in 2010. Santonio is thankful for the opportunities he has been given. He worked hard not to squander them, and has achieved success as a professional athlete. Now he's committed to giving back to the community and those less fortunate than himself.